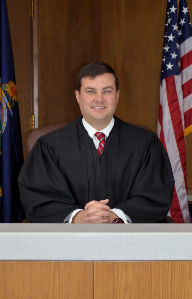 Judge Jason E. Geier was appointed to the bench in 2017. A native of Topeka, Judge Geier is a graduate of the University of Kansas and the Washburn University School of Law. Judge Geier engaged in the private practice of law for nine years, served as a Senior Assistant District Attorney in Shawnee County for seven years, and was the Administrative Municipal Court Judge for the City of Topeka. He is a member of the American, Kansas and Topeka Bar Associations, as well as the Sam A. Crow Inn of Court. He is married with one son.